IN STOCK.No Freight & No Set up fees. Finance rates as low as 4.99%. Call for more information. The new KTM 350 SX-F continues to deliver a dominant mix of horsepower and agility. For 2019, it has gained even more performance and torque, bringing it ever closer to the power of a 450, without losing its 250-like agility. When you're looking for more than one advantage, this powerful, lightweight racer combines all your needs into one dominant package with serious championship pedigree to back it up. BODYWORK & GRAPHICS: The KTM 350 SX-F is a standout performer that has already made a huge impact in the industry. However, with the help of KTM's factory riders, as well as KTM R&D and Kiska Design, the new bodywork on this radical machine makes an even bigger statement than before. The new design features on all the 2019 SX models and achieves complete harmony between rider and bike, down to the finest details. The designer's main goal was to provide the perfect contact points for the rider to enjoy maximum freedom of movement and improved handling. The I-beam design for the front and rear fenders are prime examples of the intelligent design that appears in every element of the bodywork, guaranteeing maximum stability at the lowest possible weight. 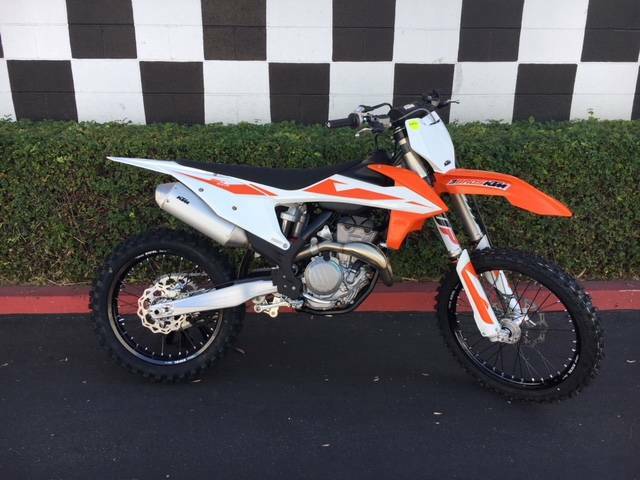 Simply riding a KTM 350 SX-F attracts the attention of onlookers, but the new graphics definitely makes them turn for a second look. DECALS: New graphics convey the READY TO RACE character of the 2017 SX-F model line. CHASSIS: The KTM 350 SX provides an unrivalled combination of agility and power. The chassis on this model plays an integral role in its renowned maneuverability and also provides accurate feedback between track and rider. For 2019, a new lightweight, high-tech steel frame was developed and has been optimized for more accurate rider feedback. Its refined flex characteristics ensure the bike soaks up those big hits while still delivering excellent agility and high-speed stability. 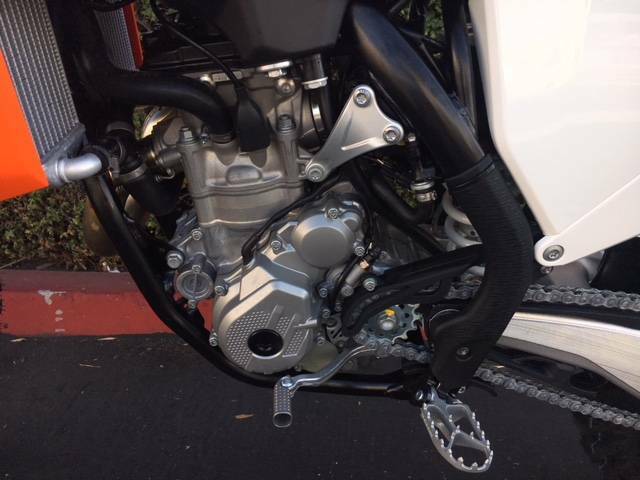 The chassis also features additional innovative elements, like "no dirt" footpegs and new brackets for mounting an optional composite skid plate. Overall, every element of the chassis contributes to an intuitive, high performance ride like no other. AIRBOX: The airbox design offers maximum protection of the air filter while ensuring maximum airflow. The large twin-air filter is mounted in a stiff cage, which at the same time holds the system in place. This design is so simple, you could still pop a fresh one in with a face full of mud. Without tools. In seconds. 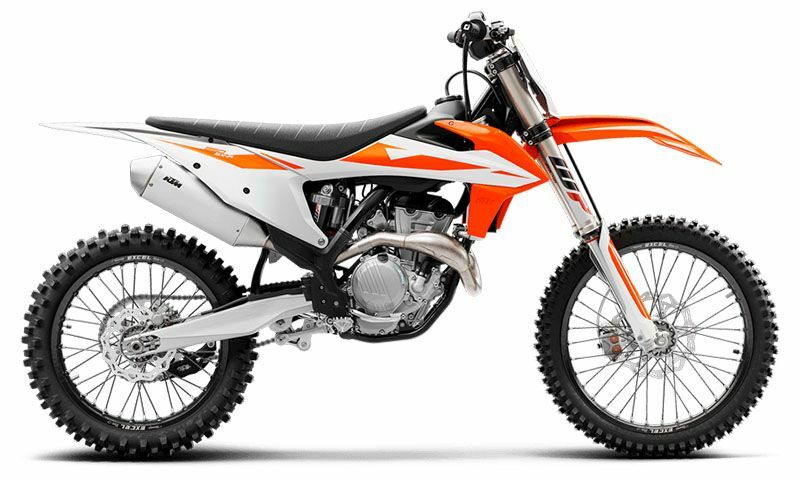 ENGINE & EXHAUST: Neatly arranged in a compact and light (26.6kg) construction, the engine of the 2019 KTM 350 SX-F features many new enhancements. A new clutch, improved transmission and a redesigned, lighter DOHC (double overheard camshaft) cylinder head, all contribute to making it stronger than ever before. Fitted with the latest electronic fuel injection system and a useful electric starter, just one push of a button fires up this impressively smooth and competitive engine. CYLINDER HEAD: The cylinder head features two overhead camshafts with friction-optimized cam followers boasting a DLC coating and high-flow ports. Four lightweight titanium valves maximize the flow rate for an optimal power band and outstanding performance across the seemingly endless rev range of 13,400rpm. Lateral brackets made of aluminum allow an efficient fixation of the engine to the frame and contribute to the bike’s featherweight feel. CRANKSHAFT: The 350 SX-F’s crankshaft utilizes a short connecting rod, which makes for an overall compact and lightweight engine with a snappy power delivery. A plain big-end bearing with two force-fitted bearing shells runs directly on the crank pin. This design is a major prerequisite for the extremely high engine speeds and the unrivaled maximum power of the 350cc engine. Not only that, it also enhances the engine’s durability, allowing long crankshaft service intervals – a customer benefit in respect of time, effort and cost. ENGINE MANAGEMENT SYSTEM: The 350 SX-F is fitted with an electric starter as standard, which is a clear advantage when it comes to crunch time in the heat of battle. A strong starter motor made by Mitsuba and the proven starter drive will fire time and time again at the push of a button. CYLINDER AND PISTON: Inside the short cylinder, with a bore of 88mm, thumps a box-type piston made by CP. Its crown geometry is adapted perfectly to the high-compression combustion chamber (14:1), where its rigid structure and low weight shine. Thanks to the low oscillating masses, the engine is both snappy and strong. 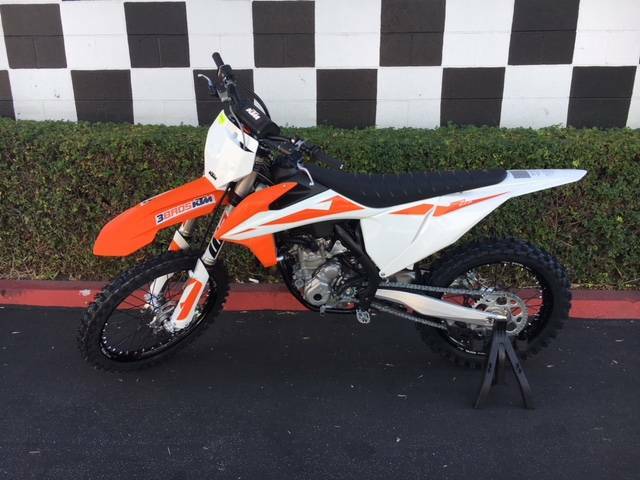 E-STARTER: Like all KTM 4-stroke motorcycles, the 350 SX-F is started at the push of a button - a priceless advantage when you’re on the clock. HANDLEBAR MAP SELECT SWITCH: All 4-stroke models are equipped with a sophisticated new multi-functional handlebar map select switch, which does three things:Activation of the traction controlActivation of the launch controlSelection of two power curves (Standard or Advanced)The traction control is a unique feature that none of the competitors can offer. It guarantees more efficient traction when the track conditions are less than perfect. Push the button and reign supreme. With this map select switch the rider can also activate the launch control, which provides more efficient starts out of the gate so you can go for the holeshot, time and time again. How? It simply reduces the maximum engine speed for the very first moments of the start, in order to give you better control. Push both buttons when the engine idles and the EFI control lamp mounted on the upper triple clamps will let you know you are READY TO RACE. In addition, the map select switch gives the rider the chance to select an alternative, more powerful map beside the standard configuration. Welcome to the future. EXHAUST: Competition noise limits are a real challenge for every manufacturer. 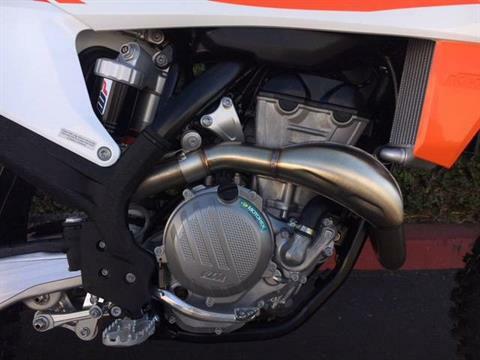 Therefore, KTM has put a lot of effort into the development of their exhaust systems. All 4-strokes are fitted with headers that have a unique standard feature; an additional resonator system – a small chamber connected to the pipe. All 4-strokes are fitted with a short silencer, mounted as close to the engine as possible. You know what that means: extra mass centralization and better rideability. Its advanced internal design reduces the noise sufficiently in order to sit safely below the noise limit, while still raising the hairs on your neck. ERGONOMICS & COMFORT: A rider's ability to work together with the bike depends on how quickly and easily he can maneuver around his motorcycle. In order to ensure optimal rider control, KTM has focused extensively on the best ergonomics for high-level performance. The neutral riding position is comfortable and, through various handlebar positions, can also be adjusted to suit every rider and condition. A rider's main interaction with the motorcycle comes through the bodywork, seat, footpegs and handlebars and these crucial contact points play a vital role in a rider's ability to maintain balance and control. 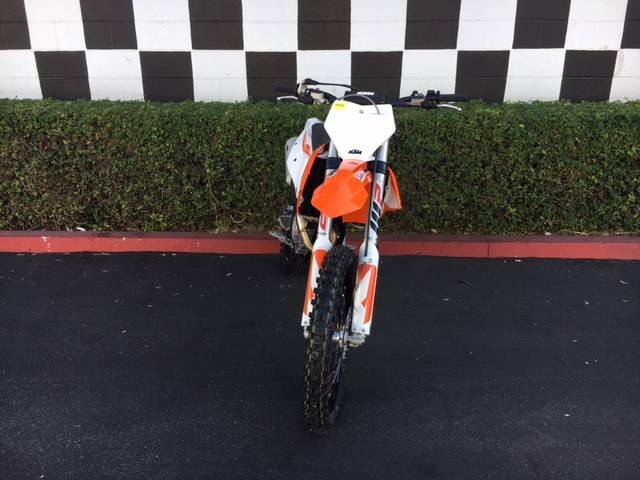 When it comes to ergonomics, KTM chose to use only the best quality products, ensuring the KTM 350 SX-F, as well as the entire SX range, provide unrivalled feeling and control out on the track. 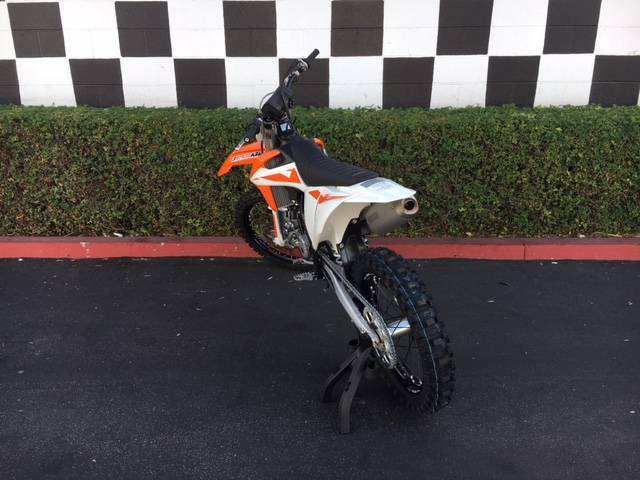 SOFTWARE & ELECTRONICS: The KTM 350 SX-F is a revolutionary motorcycle at the forefront of progression in motocross. It features innovative electronics that help to refine its incredible power-toweight ratio, maximizing power delivery. Activated by a multifunctional handlebar map switch, a rider has instant access to traction control, launch control and even alternative power curves. KTM's engineers have spent many hours pushing the extremes of performance, making electronics a necessary innovation that ensures the most effective power delivery. KTM SX-F models also have the advantages of a proven electric starter. Just one simple push of a button and you're READY TO RACE.